Ayesha Curry is a Canadian-American actress, cookbook author, celebrity cook and television personality. Despite having no professional culinary training, she has built a successful career as a chef. As an actress, she appeared in guest roles on several television shows and movies including Dan’s Detour of Life, 10 Items or Less, Whittaker Bay, Love for Sale, Hannah Montana, Good Luck Charlie and The Little Ghost. After her string of guest roles, she began hosting her own cooking show on Food Network – Ayesha’s Homemade which began in 2016. However, her actual culinary career began in 2014 when she prepared a meal demonstration on her Youtube page, Little Lights of Mine. Since then, she has authored several videos and seen her youtube page grow in content and subscribers. The channel now has over half a million subscribers. She published a book, The Seasoned Life, in 2016. Ayesha Disa Alexander was born on the 23rd of March, 1989 in Canada, Toronto to be specific. Her parents are Carol and John Alexander and she has four siblings – Jaz, Chad, Janiece and Maria. Ayesha is undeniably very beautiful and as a result, people are curious about her ethnicity. She is of mixed ethnicity – she is of Chinese Jamaican and Afro-Jamaican descent on her mother’s side, and of African American and polish heritage on her father’s side. She was raised in Toronto until age 14 when her family relocated to Charlotte, North Carolina. While in Canada, she attended the Arts York drama program at Unionville High School, which has been attended by several celebrities including Emmanuelle Chriqui and Hayden Christensen (who starred as Anakin Skywalker in the Star Wars prequel). From a young age, Ayesha Curry realized she had a passion for acting. At the age of 12, she appeared as the love interest in Suga Prince’s music video – Too Young To Love. Not too long after, she appeared in several movies including Underground Street Flippers. Her acting appearances were not limited to movies, she also appeared in several television shows including Hannah Montana and Good Luck Charlie. As much as she loved acting, she also had a passion for food. It did not occur to her to turn her passion for food into a career until she started building her family and she was encouraged by her husband to start a blog sharing lifestyle and cooking tips. She started with a Youtube channel and this led to her current show on the Food Network, Ayesha’s Homemade. Talk about an impressive career growth. Her show follows both her personal and professional life and features appearances from her husband and children. 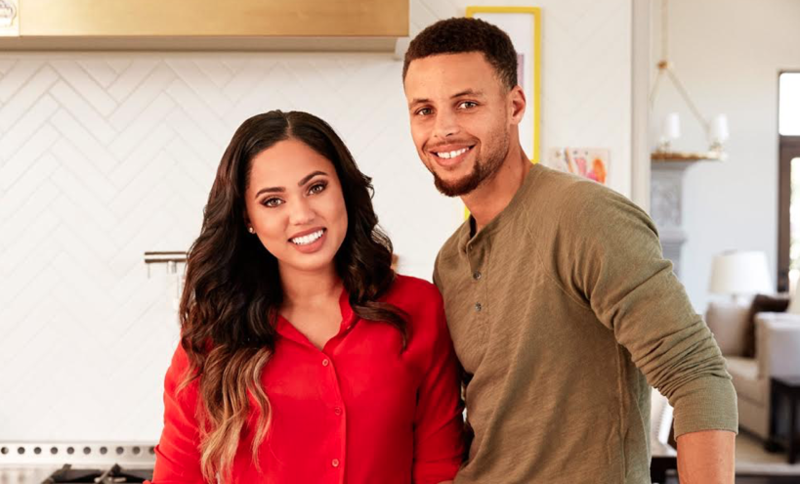 While the first season was called Ayesha’s Homemade, the second season was called Ayesha’s Home Kitchen. The first and second season ran for six episodes each. She also has her own company, Little Lights of Mine, which sells its own brand of extra virgin olive oil. The company gives 10% of all its proceeds to the ‘No Kid Hungry’ charity. She still posts her written recipes and instructional cooking videos on her blog and Youtube channel. She has also collaborated with famous American chef Michel Mina in his Bay Area pop up restaurant – The Mina Test Kitchen Of International Smoke. This was in 2016, the same year she published her book, The Seasoned Life: Food, Family, Faith, and the Joy of Eating Well. On the 20th of September, 2017, she was named a spokesperson for CoverGirl cosmetics, becoming the first spokesperson for the brand that is neither a singer or an actress. The next day, she was also announced as one of the new hosts of The Great American Baking Show on ABC. The show is the American adaptation of the British hit show The Great British Bake Off. She also admitted while on Entertainment Tonight that she was approached to join Dancing With The Stars. On the 30th of July, 2011. She got married to the Stephen Curry, an American professional basketball player who has been called by many as the greatest shooter in NBA history. The two met when they were teenagers at a church youth group in Charlotte and have been together ever since. They have two daughters together, Riley Elizabeth Curry, who was born on the 19th of July, 2012 and Ryan Carson Curry who was born on the 10th of July, 2015. The couple announced on the 2nd of February, 2018 that they were expecting their third child. Ayesha Curry and her family currently reside in Alamo, California. The actress and chef is known for her slim and fit physique. She currently weighs 55kgs (121lbs) and is 5 ft 8 in (173cm) tall. Her body measurements are 34-28-38 and her bra size is 34B while her shoe/feet size is 10 US. Ayes Curry currently has an impressive Net Worth of $16 Million dollars. This a culmination of her acting salaries, her company profits and her guest appearances. The woman deserves a round of applause for her ambition, her achievements and her surprising net worth.